Installation of your new WakeBlaster is simple. Attach the control box to the boat with the enclosed fastening tape. Connect the supplied power cable to the boat’s 12‐volt power, and connect the control cable to the back of your stereo. The WakeBlaster Box must be mounted with the control knob so that it is accessible by the operator. The unit can be mounted either horizontally or vertically. Attach the WB box with the enclosed fastening tape. Note: The WakeBlaster is not waterproof, so select a mounting location that will remain dry. Make sure that the WakeBlaster box is as close to level as possible. Also, make sure that the WakeBlaster box is oriented so that the power cable faces the bow and the control knob faces the stern of the boat. Orientation is important for the WakeBlaster to accurately detect the angle of the boat. Locate a 12 volt power source near the mounting point of the WakeBlaster. Using the power cable provided, connect the red wire to the positive power () and the white wire to the ground (‐). Be sure to connect the power cable to a circuit protected by a fuse that is 5 amps or less. Note: If you have an available accessory switch, we recommend that you attach the power cable to the accessory switch. Caution: WakeBlaster must be connected to a circuit that is protected by a fuse or a circuit breaker that is rated at 5 amps or less. If wiring directly to the battery, be sure to use an in‐line fuse of 5 amps. DO NOT WIRE DIRECTLY TO THE BATTERY WITHOUT A FUSE. Using the provided stereo control cable, plug the cable into the stereo’s wired‐remote control port on the back of the stereo unit. Plug the 3.5mm (headphone style) end of the cable in to the center port on the back of the WakeBlaster box. 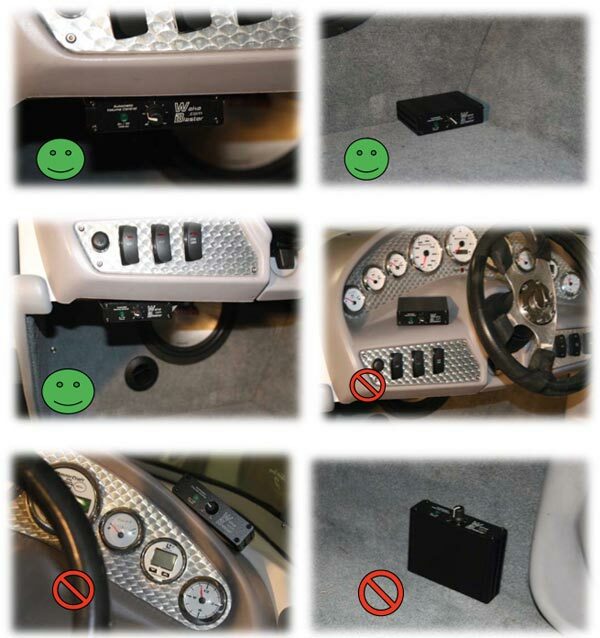 WakeBlaster can be installed to operate in conjunction with other stereo wired‐remotes. Some boats come with factory installed driver’s side wired‐remote controls. These remotes are connected to the boat’s stereo with an extension cord. If your stereo already has a wired‐ remote installed, you will need to install a “Y” adapter between the stereo and the remote. Then plug the wired‐remote and the WakeBlaster into the “Y” adapter. Some stereos use a handheld infrared remote to control the functions of the stereo. The WakeBlaster can control the volume through infrared signals. This eliminates the need to use a wired‐remote connection. 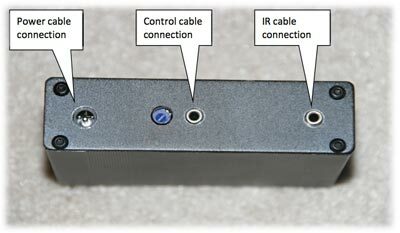 With the optional IR cable, simply plug the cable in to the back of the WakeBlaster box. Peel and stick the IR emitter to the front of the stereo, near the stereo’s IR input window. WakeBlaster is designed to automatically adjust the volume of your stereo while pulling riders. WakeBlaster senses the boat angle. If the bow is up, the volume goes up. If the bow is level, the volume goes down. On the front panel of the WakeBlaster box, there is a single knob that controls the amount of increase in volume. The driver can increase the amount of volume‐increase by adjusting the selector knob to the right. If you wish to turn off automatic control of the volume, turn the knob to the “Off” position. After installation, the WakeBlaster needs to be calibrated. To calibrate, ensure that the boat is in neutral and in relatively flat water, then quickly turn the knob from the off position clockwise to the Max position. The green LED will rapidly blink several times to let you know that the unit is calibrating. Once calibrated, the green LED will stay illuminated. Then turn down to the desired volume increase level. The WakeBlaster will remain calibrated even if turned off or if power is removed. Note: It may also be necessary to recalibrate if the level of the boat changes due to weight or ballast changes. Caution: Excessive volume may damage your stereo equipment. WakeBlaster can increase the volume to very high levels. When first setting up the WakeBlaster, be sure that you start out with your stereo in a barely audible position to determine how much increase is needed. Do not set the control knob to a position past the mid‐point until you have determined safe levels for your system. Accelerate your boat normally to your typical cruising / riding speed. The volume should increase after about 3 – 5 seconds after you accelerate. Pull the throttle back to neutral. The volume should decrease 3‐5 seconds after you decelerate. Before getting started, make sure that you have turned down the volume on your stereo. The music you hear should be the low‐volume level that you desire. If you desire less volume increase, turn the control knob counter clockwise. If you desire more volume increase, turn the control knob clockwise. Accelerate the boat as you normally would to your desired riding/cruising speed. The volume level will increase after about 3 seconds of acceleration. When you decelerate the boat, the volume will return to the low‐level setting after about 3 seconds. Note: If you are cruising at a high speed where the angle of the boat levels out, WakeBlaster will automatically lower the volume of your stereo. For this type of cruising, we recommend that you turn off WakeBlaster by turning the knob counter clockwise to the off position. Note: While pulling skiers the volume will go up as the bow angle of the boat changes. Depending on your driving style, the stereo volume may turn down inadvertently during aggressive driving. If this happens, continue to pull the rider and the volume will eventually return to normal level.